Ruth Hartman, author of My Life in Mental Chains, Launches her Blog Tour! Ruth J. Hartman was once “normal.” She perceived the world around her as any other person would--until she turned 27. That’s when Obsessive Compulsive Disorder (OCD) dug in its claws and refused to let her go. Her world (and her family’s) was turned inside out. Working as a dental hygienist was difficult enough, but trying to balance her work life with the challenges of OCD was overwhelming. Ruth’s family, friends, and co-workers didn’t understand why she suddenly acted so bizarre. She wanted to help them understand, but she couldn’t. She didn’t understand it herself. My Life in Mental Chains is moving and tragic, yet in the end, it’s an uplifting story of personal faith and inner strength. Ruth’s insight will be a great comfort to OCD sufferers, their families, and their friends. She lives in rural Indiana with her husband and two cats. Visit her website at www.ruthjhartman.blogspot.com, or contact her at RGHartman@aol.com. If you received our Events Newsletter, remember, we are holding a contest to win a signed copy of Ruth's book, My Life in Mental Chains, to those that comment. So, grab a cup of coffee, pull up a chair, and enjoy the chat, and share your thoughts, and comments, at the end. We will randomly choose a winner from those who comment. Enjoy! WOW: Welcome to WOW!, Ruth. We’re delighted to launch your blog tour for your book, My Life in Mental Chains: My Struggle With Obsessive Compulsive Disorder (Pipers’ Ash, 2008). I’m fascinated with authors who can write personal memoirs and share very private events with the rest of the world. How long did it take you to write My Life in Mental Chains? 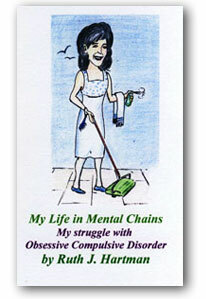 Ruth: I started writing My Life in Mental Chains in July 2008, and it was published by Pipers’ Ash in November 2008. It didn’t take long to write because I didn’t have to do any research for my subject (me! ), so it came together quickly. OCD does have one redeeming quality for an author: you become obsessed with writing, and that keeps you working until the book or story is finished. WOW: You’re right, that was quick! Did writing in your journal, as prescribed by your doctor, help you with your writing? Do you still write in your journal? Is that what helped you get started with your writing? Ruth: The writing I did for the prescribed journal was, for me, more of a painful reminder of my daily obsessions than a writing exercise. I don’t keep a daily journal; I’m better off now if I don’t analyze what’s happening to me every day. If I have something that’s bothering me, dwelling on the problem only makes it worse. That in itself can push me into an obsessive loop that doesn’t want to let me go. My best course of action is to either ignore it (tell it “I don’t care”), or to use exposure therapy for the thing that frightens me and immerse myself in it quickly and get it over with. WOW: I know that for me, sometimes I’m afraid to write down what I really think or feel. Do you think honest journaling helps a writer’s growing process? WOW: Thanks for that advice! I can see the honesty in your book, which I really enjoyed reading! You took me into a dark place I didn’t know much about, and I felt like I was taking the journey with you as you described everything that happened in such great detail. Telling millions of people about a very intimate part of your life must be difficult. Can you give us any advice on how to write a personal memoir? Ruth: My actual diagnosis was in 1990. I was 27. So to write this memoir, I had to dig deep. I made myself think about things I’d tried to forget. My mom said to me, “You had to go through it all over again to write this, didn’t you?” And yes, I pretty much did. The only difference is, now I have the blessing of medication and therapy to help me. At that time, I was just one big raw nerve ending. All the events in the book are true; they all happened to me. Some of the memories are so painful and permanent, they’re seared into my brain. Some of the dialogue is exact, other dialogue comes from the memory of how I felt that day and how someone else was treating me. On those occasions, it may not be word for word, but I can put myself back there, in that room, in that place, and the feelings all come back. WOW: People who have OCD or know someone with OCD are very lucky to be able to read your story because you not only tell of your experience, but also tell of the support you had from your family. It’s a story that needs to be out there. Was it hard to find a publisher? Ruth: I got the name for this publisher from the Magazine Markets for Children and Teenagers. Pipers' Ash is a small non-profit publisher, and they only work with a few authors at a time, which is why my book was published so quickly. I had intended to write a fictional story about a teenage girl with OCD. I submitted a 25-word query, as suggested by their guidelines. The reply, however, was that stories such as mine (or any story about abuse, adoption or other personal experiences) are better told in the “True Life Series.” I re-submitted my query to the “True Life Series”, and over time was asked to submit a synopsis, first chapter, then the full manuscript. My original idea for a fictional teen story has not yet been accepted by any publisher. WOW: It sounds like Pipers’ Ash is a very personable, author-friendly publisher! What was the publishing experience like? Ruth: Pipers’ Ash is very kind, patient, and tolerant. I never felt pressured. I never felt insignificant or ignorant, although I was ignorant! With the exception of a short story that has been accepted somewhere else (and hasn’t been published yet), this was my first experience working directly with a publisher and going through all the basic steps for submission and publication. I didn’t even know what a synopsis was! I literally had to go to the bookstore and buy a book on the subject. WOW: (Laughs) Now that your book has been published, it’s all about getting the word out. I’ve heard that self-promotion is a big part of the process. What are you doing to promote your book? Ruth: I’ve contacted my local newspaper, bookstores and library. The newspaper article should be coming out soon. My books are at the local Hastings Bookstore on consignment, and my local library wants to buy 2 copies of the book later this month. But I think this blog tour, beginning with WOW! will be the best and most exciting promotion of all! WOW: Well thank you for taking the blog tour! We’re really excited to have you on board, and wish you all the success you deserve! I hope to see your name in print again and again. Is there anything new in the works now? WOW: I’m looking forward to reading your new book--it sounds like another great read! Have you gotten into any other types of writing, such as poetry? Ruth: My favorite writing is fiction. Especially short, humorous stories. I love writing quick, funny conversation between two people who truly care about each other. I’ve never had a flair for writing poetry though. WOW: Humor is such a wonderful way to connect with others. It’s so refreshing to have something lighthearted, especially in these tough times. Ruth, it’s been such a pleasure chatting with you today! Thank you for your time and for your insights. Are there any final golden tidbits of advice you’d like to pass on to our readers? Ruth: In terms of writing, just keep at it. Write at least a little every day. And be observant. One of my favorite activities is to “people watch.” You can learn so much about human relationships by just listening to conversations of those around you. Don’t give up if the first answer from a publisher is “no.” Maybe, as in my case, they can use your story in a different way, or they can use something else you’ve written or could write for them. Rejections are painful. But keep reminding yourself: absolutely every writer gets them. They’re never fun. They’re never easy. But often it takes the process of going through several rejections before you can get to the right publisher for the right submission at the right time. And in terms of dealing with OCD, I’m sure treatment can take many different forms for as many different people. For me, it’s a combination of therapy and daily, for the rest of my life, medication. Thankfully, my therapy now mainly consists of a once a year appointment with my psychiatrist (when I began treatment, I saw him 3 times a week.) I know a few people who suffer from OCD but won’t seek treatment. My heart aches for them. My advice for anyone who suffers from this painful disorder is to please seek help and get treatment. Your life will be happier, healthier, and more peaceful. WOW: Thank you for such great words of advice. You’ve given us a lot of wonderful and useful information. We wish you all the best in your writing journey! Want to join Ruth on her blog tour? Check out these dates and mark your calendar! You can also snag a copy of WOW's Events Calendar HERE. We're always adding new dates that may not be listed, so be sure to check it out. Ruth will be chatting with WOW! Women On Writing at The Muffin. Share your comments! One lucky commenter will win copy of Ruth's book! Ruth stops by The Mental Fitness Center's blog, Out of Bounds, to talk about the topic, "Symptoms and Treatment for OCD." It sounds like a wonderful and informative discussion. Ruth visits Darlene Devoe's blog, Raising Socially Anxious Children, and talks about how even though she wasn't diagnosed with OCD until age 27, looking back now, she recognizes the some of the symptoms in her youth: worry, depression, separation anxiety, and extreme shyness. This sounds like a super informative post. I can't wait to read it and discuss! Ruth stops by Anne-Marie Nichols' popular blog, A Mama's Rant, to talk about how she discovered she had OCD, and how she managed to cope on a daily basis (at work and at home). Ruth also shares her tips for helping friends and relatives with OCD. Great topics! I'm very interested to learn more and participate in this discussion. Ruth stops by Mary Jo Campbell's blog, Writer Inspired, for an exclusive author interview! Join the discussion as they talk about the craft of writing, publishing, and more! Ruth stops by Sher's blog, OCD-Chick: Wiping the Crazy Off My Face, to talk about living with severe OCD. This post is not to miss! Get an inside look and join the discussion. Ruth will be stopping by Whole Latte Life to talk about how overcoming any obstacle can lead to living a choice life. Joanne's blog is very inspiring and the discussions are lively. Grab a cup of coffee and join the conversation! Ruth stops by Deena's bookshelf to talk about the signals and treatment for OCD. Ruth lists what symptoms she has, her treatment for them, and some other OCD signals that people experience. Sounds informative! I'm looking forward to this post! Ruth visits Carolyn Howard-Johnson's blog, The New Book Review, and shares an exclusive review of her book written by WOW! team member, Joanne Stacey. Don't you just love book reviews? I do! Ruth stops by Donna Volkenannt's blog, Donna's Book Pub, to chat about working with her book publisher, Pipers' Ash. I always find it interesting to learn about new publishers. We hope you are as excited about the tour as we are! Mark your calendar, save these dates, and join us for this truly unique and fascinating author blog tour. Snag a copy of WOW's Events Calendar HERE. Be sure to comment on this post to enter in a drawing for a chance to win a signed copy of Ruth Hartman's limited edition chapbook, My Life in Mental Chains: My Struggle With Obsessive Compulsive Disorder.